Nutella lovers: You *have* to try this churro recipe! Nutella goes great with everything. It's just a fact. Here a quick and easy 30-minute recipe to try to satisfy your chocolate cravings! 2. Flatten each biscuit to make room for the Nutella. 3. 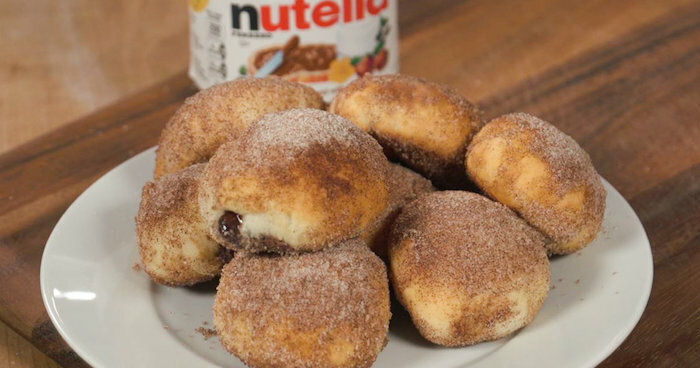 Place one teaspoon of Nutella in the center of the dough. 4. Join the corners of the dough together, and roll the dough around in your hands to form a ball. 5. Place the balls onto a non-stick pan and bake for 10-15 minutes, until balls are golden brown. 6. Mix equal parts sugar and cinnamon in a bowl. 7. Melt butter in a bowl and brush on the Nutella balls. 8. Roll balls in the cinnamon sugar mixture, coating them entirely. Do this one at a time! What yummy sweets are you making this weekend? What's the best thing you've ever baked? Share in the comments.